This is a Hydrogen Generator YOU CAN MAKE !! Industrial Hydrogen and Industrial Gases. More great details below. DVD of step by step details described below. Tell your friends - the wait is almost over. You won't believe what we have to tell you this week. As always, THANK YOU for letting us come into your personal mail box. 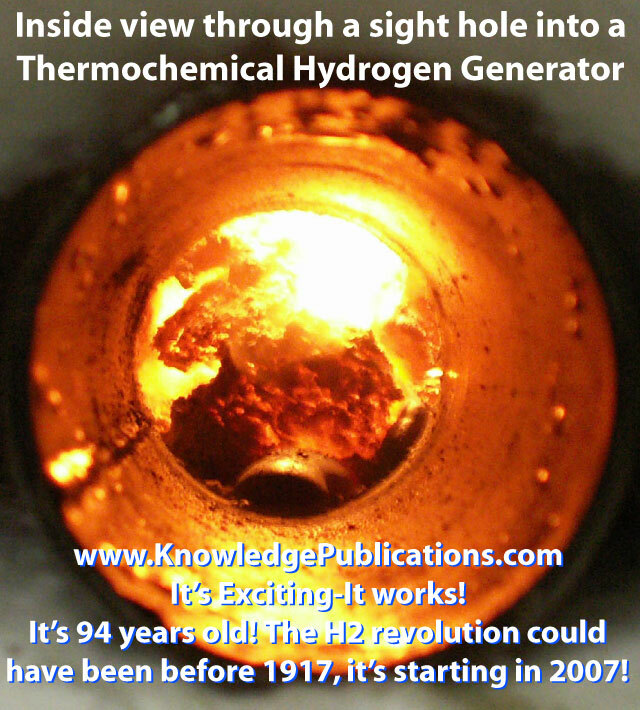 Hot Exciting NEW Solar and Hydrogen things at www.KnowledgePublications.com including MAKING HYDROGEN. Hydrogen GENERATOR Coming SOON for the Hydrogen Engine. and in the book there are many ( almost every ) way of making hydrogen and we built one of the1917 era hydrogen generators...and we used NOTHING but parts from Home Depot and Lowes and Wal-Mart. My employees were aghast and stood back with awe as the unit ran. I had some wood holding the unit upright, and the wood was on the other side of 2 inches of high temp insulation. Well the wood caught on fire. So now I need 4 inches of insulation. The iron pipe melted too.. so we'll run it a bit colder than the flowing temperature of mild steel next time. We have an OFF THE SHELF compressor that you can afford that will be described in the future DVD on this whole process. Yeah.. you'll see it STEP BY STEP...what we got, where we got it, how it went together...no welding. Everything local or easy to get.. .all sources for everything blah blah blah. Everything you have whined for over the past 4 years. Yer gonna get it and you'll like it. Make sure yourself and your friends get a head start, EVERYTHING you'd want to know about making this is in our books called Industrial Hydrogen and industrial Gases. The first order of engines are coming in that we will be converting to hydrogen and making them available for sale. The engines will be around 4 to 5 horse power and will be all set up to run on Hydrogen. Right out of the box, it works on hydrogen. Engine will come with all of the modifications professionally done from a machine shop. It will come with hoses and regulators as well as idle and throttle controls. As to the a great number of people who filled out the hydrogen survey... many are deluded beyond description. We are NOT going to be selling a conversion kit, you cannot supply your own engine and you cannot put this engine in your car. Don't think you'll be able to convert your much more complicated car engine by getting one of these. This engine we are going to sell does NOT make hydrogen, it does NOT run on water, it will NOT run on water, you WILL NOT be able to put an 'electrolyzer' on it to make hydrogen or power or anything else. You will be able to connect up a bottle of hydrogen to it and it will run. There will be an option to get the engine with a liquid fuel system IN ADDTION to the hydrogen gas system so you can RUN MULTIFUEL. You can make your own alcohol and then hydrogen boost it and run the engine. With the Hydrogen boost it will run waste veg oil, motor oil, kerosene, diesel ( yes, in the gas engine) etc.... For those of you who doubt this I will tell you that I was a development engineer in the Scientific Labs of Chrysler / DaimlerChrysler for 10 years. I know my cars, I know my engines. I have been immersed in the field of chemistry, electrochemistry and thermal chemistry for the last 15 years and working with Roy McAlister VERY closely for the same period. Roy has been converting engines for OVER 40 YEARS. See the H2 Car MultiFuel DVD for more of these great details. What we do is 100% science and we are bringing you the best. FYI: for those of you who answered all of the funny questions on the survey I had. There is NO automotive conspiracy, there is NO oil industry conspiracy. The only conspiracy is the stupidity of the public. It's the the limitation we put on ourselves that stop things from happening, not the limitations that others put on us. The online form to say you are interested in an engine is still at the link below. Please READ the instructions at the top of the form. TWICE ! FYI... in year 2007 there should be a Hydrogen and MultiFuel MOTORCYCLE available for purchase. It will be a street legal bike and all of that fun stuff done 100% by a professional manufacture of bikes. The book on how to make a fuel cell at home, with STEP BY STEP instructions are going like crazy. We have one batch left and thousand more on the way. Get yours today or you'll be on the back order list. Also out is the DOE Fuel Cell Handbook, printed in beautiful quality. A great handbook to take with you as you have time to read. Time to read and learn about all of the exciting stuff of the future. click on the MORE INFO button to see all of the details. We have "MORE INFO" up for the Alcohol book, Industrial Hydrogen, Industrial Gases and much more. Come by and see. What more do I need to say?? When you click on checkout to pay for the great books you want... you can either use your credit / debit card or you can use PAYPAL.... thanks for the feedback guys!.. and gals. We will be making the Stirling Engine Design Manual available for download soon... 400+ pages on Stirling Engines for use with solar energy and more. Why are we doing this?? Because we can. SAVING MONEY AT HOME NOW. This book will get you filling cracks and putting up insulation ( that is NOT expensive) that will reduce your heating bill NOW... tonight. I guarantee it... or your money back. The next best book set you can get is Sunshine to Dollars ( for the glass sources ) and Solar Air Heating Systems for the STEP by STEP on how to make almost every single type of solar air heater you could want. Google has made an incredible business and income by making the Internet better, bigger and MORE FREE..... Amazing, by making it "more free" they are making more income. What a great company. We are going to follow their example and make solar energy and hydrogen energy cheaper and cheaper and cheaper for you and make as much as we can for nothing.... the net was meant to be free. DO US A FAVOR PLEASE?? if you like this little newsletter we put together...send it to your friends for us please... just those who are interested in fun stuff like this... and for reading all the way to the end, here is a 5% off coupon for anything on the site for yourself and your friends. Are you looking down here? 5% off !! ...as always... we put something special at the bottom of our emails. Just for you, just because you allow us in your mail box and just because you read all the way to the bottom of the email....or maybe you just skipped down here... here is a 5% discount coupon good for ANYTHING on the site for 1 week. Thanks !